Editing seems like the easiest part of the writing process. 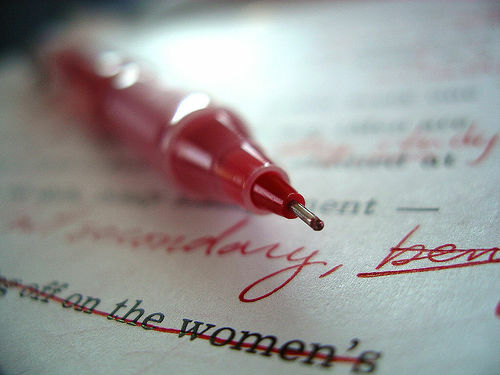 In fact, many people don’t even edit their papers, or they have someone else edit them. I admit it – when I was in college, I would email all of my papers to my father. He would email them back with a few grammatical corrections, then I made the corrections and turned in the paper. However, editing is an essential part of the process, and if you can edit your own writing, you won’t have to worry about finding someone else to do it for you. But just as with anything else, editing takes skill. The following are some suggestions for how to edit papers effectively. 1. Give yourself time to leave the paper and come back to it. Don’t finish papers the night before they are due. Give yourself at least a day to ignore your paper before you go back and edit it. When you have just written a paper, you are too connected to it to be able to look at it critically. If your professor provided a rubric, use it to edit and revise your paper. Grade yourself honestly for each section of the rubric. Remember, your professor is your audience, and the rubric is his lens for viewing your paper. Try to view it as if you were him. If your professor didn’t give you a rubric, use this one: College Writing Rubric. As you look over your paper, read it out loud. Or better yet, have someone read it to you. You may have missed words here or there; sentences that made sense to you two days ago in a paper-writing haze may now need to be revised. This is a very powerful method for finding writing that needs to be changed. 4. Detach yourself from your paper. There is a reason why the first writing attempt is called a rough draft. It is not supposed to be perfect. In order to fix your paper, you may have to make drastic changes. Go into the editing process with an open mind and be willing to throw entire sections away. If they don’t advance your thesis statement or strengthen your paper, you don’t want them in your final draft. 5. Check out my blog entry on choosing more academic words for your paper. Changing a few nonacademic words to their higher brow counterparts can make your writing sound much more scholarly. After you have thoroughly edited your paper, take yourself out for a margarita. You deserve it. I will like to add one other suggestion to a good list. Read your paper backwards, before you turn it in. A college Professor gave this suggestion. Her reasoning is that by the time you write, and re-write your paper you know it by heart and can miss many errors, if you read it from the beginning. Reading it from the end helps you to find errors, you may otherwise overlook. Thanks for your suggestion, Beverly! It makes a lot of sense.